In 2017 most video game consoles look pretty similar: black boxes of varying size aimed at being as discrete as possible. The brands who manufacture and distribute them also have more clout and prestige of their own. 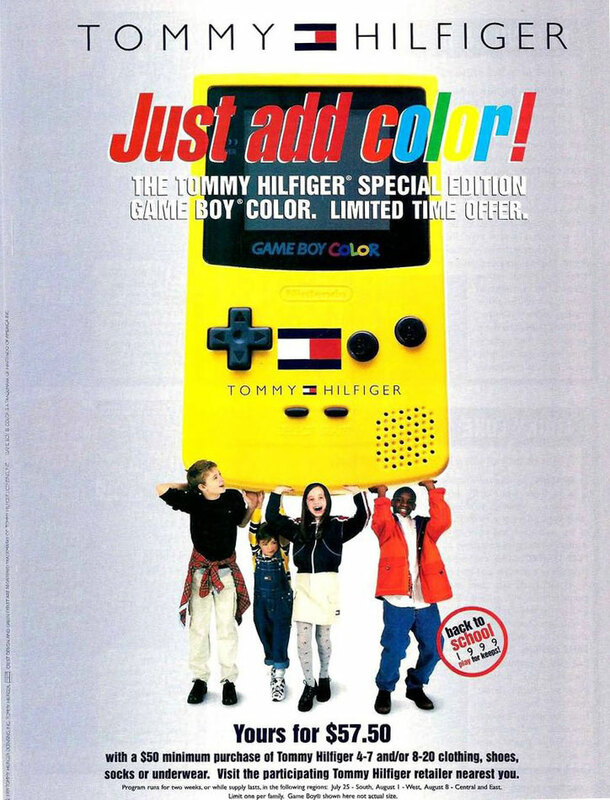 So it’s weird to think that in the late 90s Nintendo thought it was important to use Tommy Hilfiger to promote the Game Boy Color. Re-read that last part and just let the cynical whimsy of it wash over you. Then take a second to imagine the floppy haired designer behind the self-titled line of over-priced normcore flashing a Pikachu inspired gadget while waiting at the bar. Nintendo recently partnered with other fashion brands to create a line of gaming inspired clothes, but it’s hard to imagine a limited-edition, torn denim Urban Outfitters Nintendo Switch coming out in 2017, despite the obvious cross-over between the clothing outlet’s target audience and the handheld’s initial marketing. 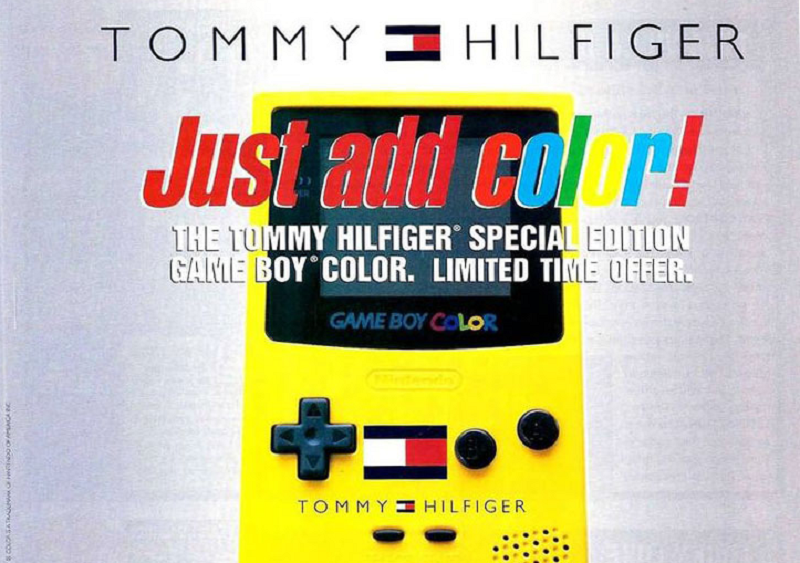 Still, there’s something quaint to the idea of two completely unrelated companies like Nintendo and Tommy Hilfiger collaborating to exploit people’s insecurities about whether they’re cool enough. In fact, the random, cross-promotional, special-edition video game console has a longer than expected history that acts as something of a time capsule for conspicuous consumption over the past several decades. Part of me hopes that in the future these unlikely partnerships will continue, but in the meanwhile here’s a brief look at some of the more random ones. Probably the ugliest special edition console ever designed, the Audi R8 was meant to combine the allure of sporty German cars with a box of computer chips. Maybe there was a way to square this circle, but an Xbox One S in the shape of a faux-Audi R8 hood was not it (the Lamborghini One S is gaudy but still better looking). The shear audacity of it was inspiring though, and I applaud any and all efforts to design any future video game consoles in the shapes and colors of un-related everyday objects. A deep purple case with the Taco Bell icon peaking out from the lower right made this particular limited edition console particularly brazen. Instead of just awarding the winner of a contest selected from those feasting on crunchwrap supremes a simple box they could play Gears of War on, Taco Bell decided that lucky individual would have to shoulder the burden of showcasing the companies marketing for whatever wanton soul passed through their abode. It wouldn’t even be that terrible without the logo (I went with the purple 3DS because, while the color does nothing for me in general, I’ve had a special place in my heart for eggplant-looking hues ever since Kid Icarus). A great movie, a terrible game, and a really lazy console. The Men in Black PlayStation is incredibly rare, fetching over a $1,000 on some second-hand retailers, but also really boring. Just jet black with the movie’s logo plastered over the disc lid. But it was also emblematic of a time when being a blockbuster film insured some sort of video game spin-off, and in this particular case, even a console sku. I talked about this particular one at the top, and it remains my personal favorite, mostly because of how dissonant the combination is. The Game Boy sold for $60 at the height of the Pokémon craze if you purchased a certain amount of Hilfiger merchandise. That’s not something my parents would have ever done, but I can still remember looking through a fall catalog imagining what boring polos I might wear in exchange for the opportunity to capture an Oddish in full handheld color. Unlike a lot of other weird branded stuff, there’s plenty of stuff bearing the Coca Cola script; Toy trucks, cups at somewhere around half of all chain restaurants, any time you see a polar bear sitting on an ice cap. A Coca Cola Game Gear though? Something about it still feels unnerving, like I’d always be thirsty while playing sub-par platformers on a really tiny screen. Maybe when the soda company realizes the error of its way and brings back Coca Cola Zero proper they can cross-promote with the Vita’s successor. No doubt the oddest of all, Marlboro, a cigarette company, went in on the failed Atari Lynx handheld. In the end it was something of a match made in heaven, given the declining fortunes of both companies, even if Marlboro still sells nicotine and Atari no longer sells handhelds and the latter never killed anyone while the former has battled endless lawsuits about the lethality of its product. Customers would work up points with each new box of smokes which could be traded for different stuff, including a giant red brick of a handheld. While the prospect of another cigarette branded console might seem like an impossibility, vape-enthusiasts seem to have a way of making things happen. Even if Nintendo doesn’t release a vapa-able JoyCon in the near future, I wouldn’t put it past DIY gamers to make it happen.